Why Guatemala? Many regions of the world combine the magnetic beauty of Guatemala and extreme poverty in parts of their population. Why highlight an area of Guatemala in paintings and why donate all profits from their sales to a charitable organization (Aldea Maya) working in Lake Atitlan in the the Guatemalan highlands? But…why NOT Guatemala? The work of Aldea Maya in Chukumuk, a Mayan village up the volcanic slope from Santiago, has enabled children to extend their education. Before it supported students, only 2 children went on beyond elementary school. Now that it organizes sponsorships, 85 children are currently in “basico” (junior high school) and some have presently gone on to high school. Why not give the students and their families a hope for a better life in the future? Theo’s experience as a volunteer, teaching art in the school and getting to know the students, has confirmed his commitment to those Mayan kids. Below are two categories of paintings, all of them for sale to raise funds for Aldea Maya: paintings of Guatemala that Theo has done himself, and paintings of Guatemala done by his students during his volunteer project. All are for sale, and all profits will go to student education in Chukumuk. 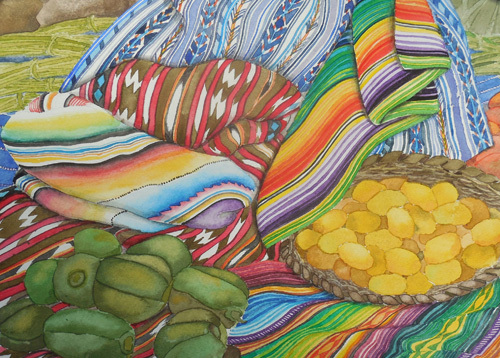 These paintings are all inspired by the people and land of Guatemala. For information on the medium, dimensions, and price, hover your cursor near the bottom of the image of the painting. Below: acrylic on cork, reinforced. Dimensions are in inches. For details, hover your cursor near the bottom of the image. These are done by the children of a village called Chukumuk, near Santiago on Lake Atitlan. Aged 14 to 16 years old, these children are the survivors of a devastating landslide in 2005. Because of the efforts of the charity Aldea Maya they are able to attend to school. In April 2015, Theo joined their school as a volunteer and ran a series of special art classes. The paintings are all done with acrylic paints on reinforced cork, using a process Theo developed, and based on native birds, flowers and butterflies of Guatemala, or local markets. They are sold here to raise funds to help the kids stay in school. Every bit helps! The square paintings (12×12) are $50, and the narrower ones (6×12, half the size of the square ones) are $35.